In my quest for sensational stories that will generate thousands of blog hits which in turn will drive sales of my novels I now step into the arena of the Trayvon Martin death. Here is my take on it. The police didn’t investigate diligently enough, community uproar ensued, case now being pursued. So, anyway, that’s done. Seriously, that’s it. Who disagrees? No one. Yet the madness continues on the front page of every newspaper and in the outraged mouths of politicians, pundits, internet flame mongers, crack whores, meth heads, six legged calfs, a rock sitting by the Current River, and this disgusted Libertarian blogger. Do we have nothing better to discuss? Is yelling nonsense at one another the new America’s Sport? What’s the story here? Everyone agrees. If, down the road, the police investigation is shoddy then further outrage can ensue. I’m guessing they are going to be very thorough this time. Just my wild take on it. Now, let’s get onto what’s really happening here. I’m sure this will come as a surprise to you jaded listeners but there are some alternative agendas out there that have nothing to do with the parties involved in the shooting. Shocking, no? Media outlets want to sell advertising, politicians want votes, flamers want to flame, blacks want a cause, whites want a cause, half-Peruvian want a cause, talking heads want to foam at the mouth in indignation, I want to vomit. Here’s the lesson. Listen to the people with an agenda if you must but find out what their agenda is and take it into account. And, if you want to view some interesting media look at this, or this, or this, or this. Just maybe, if you, the public, the one in charge, clicks articles like that then the media outlets might focus on them, maybe the pundits would talk about them, maybe the politicians would think about them, maybe … oh forget it … someone won the lottery! It has been suggested to me that one reason my blog isn’t getting tens of thousands of hits is because I’m not taking on controversial topics. I’m happy to look at issues like that provided there is something to talk about. I just don’t see it in the Trayvon Martin case. Nothing to talk about, you ask? Yep. And I’ll tell you why tomorrow. This way I can fool myself into thinking I’m not trolling for sensationalistic stories and actually troll for sensationalistic stories. Hmmm, am I just like all the other media outlets? You tell me. Most of you probably haven’t heard of the Open Source movement. Boiled down, Open Source is a philosophy that promotes free redistribution and access to an end product’s design and implementation details. On the surface is it inimical with capitalism and therefore something I’ve always viewed with strong suspicion. Today I aim to look at it with a critical eye. To be honest, even as I’m sitting here writing this article I’m not sure of my conclusion. I might have some misconceptions and hopefully in doing my diligent research I’ll come to objective answers. The reason Open Source comes at the conclusion of Internet Week is that the concept has its strongest backing in the software world and I benefit greatly from it. As do many people, likely you. As some of you may have gathered from reading my posts over the last couple of months I’m somewhat (read completely) nerdy. I play role-playing games like Pathfinder. As adults we find it increasingly difficult to get people together physically. Well, a group of fellows got together and created an Open Source Virtual Table where my friends and I can gather from all over the world (on the computers sitting at our desks) and play. It’s called MapTool and it’s free. Free. We talk to each other using Skype. Also free. This idea goes far back in time as Wikipedia states when it suggests that cookie recipes have been shared (thank goodness) since people first started baking the delicious treats. Mmmm, cookie. This Open Source model helped DARPA create the internet which I spoke about earlier in the week. Benefit from that much? Anyone who uses the Linux operating system is benefitting from the model. WordPress where you read this blog is Open Source as is a computer language called php. A piece of circuit board called Arduino powers hobbyists electronic equipment. It’s free. OpenCola is a soda dispensary system where the formula is freely available. Wikipedia is free and open to the public to contribute to its pages. Open Source education includes instructive videos on YouTube and the Khan Academy. The people who produce these type of things do so on their own time for the pleasure of it. They largely work collaboratively with many thousands of ideas being suggested to improve the product. I spoke about this concept earlier in the week as well. Here is the question though. These Open Source projects clearly benefit the consumer but do they actually help capitalism as well? It seems an impossible proposition that a free product could stimulate economies and certainly those opposed to Open Source agree. But there is another argument. Let’s get back to my role-playing games. In order to play the games we do not only need to get together but must also have material by which to play, rule sets, adventures, background material, etc. If we didn’t play, because we cannot physically get together, then there is no need to purchase these items. But, with MapTool we do get together and this stimulates the other purchases. OpenCola gives the recipe away but equipment and ingredients still must be purchased. The other benefit is that the creators of the items get to use their creation. These types of projects are often labors of love trying to fill something that is currently missing from their experience in life. They see something they would like to have and, with the help of thousands or millions of others, make it. So, I think in the end, Open Source is a wonderful idea although I’m certainly not suggesting that people should stop trying to make money. It’s an interesting topic and we’ll see the reality of it played out in ever greater instances over the coming years. Tell me what you think in the comments and share away! Tomorrow I’m to talk about an interesting topic at least from the point of a view of a Libertarian. Open Source is a movement in which a product is open to the public for development and largely either free or of a particularly low-cost. This movement seems inimical capitalism but I think that might not be the case and I’ll examine the issue tomorrow. My weeklong blog on the internet isn’t exactly setting the world ablaze with interest but I’ll continue on despite the complete lack of evidence that anyone is at all interested! I’m stubborn that way. Tomorrow I want talk about the World Wide Web Consortium that was created by Tim Berners-Lee and how its employees manage the standards for the internet. I am going to get some serious Libertarian and Objectivist ideas into this post so if you are one of the two people who has been keeping up with Internet Week then you’re in store for a treat tomorrow! Two days ago I discussed how the DARPA government agency conceived of and funded the creation of the first internet. Then yesterday I spoke about Al Gore’s role in the development of the internet. Today I’ll talk about a fellow named Tim Berners-Lee who was and remains instrumental in the World Wide Web. First let’s discuss the difference between the WWW and the Internet because I think there is a lot of confusion. The internet is simply all the computers that communicate with one another. This involves an alphabet soup of acronyms none more important that TCP/IP but I don’t want this to get blog to get too technical. The WWW is all the documents connected by hypertext. This sounds strange but every time you visit a web page you are seeing a document and said file is being “rendered” by your browser into images and text. Sir Tim, as he is now known, wrote a proposal in 1989 that involved using something called hypertext to link documents. 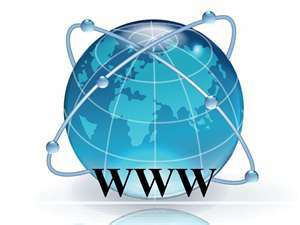 He along with Robert Cailliau then refined their proposal envisioning the WWW accessed by people like us using browsers. Sir Tim then created a Web Server, a computer with files that could be interpreted by the first web browser that he also created. He then posted this information and made his server available to all comers. In doing this he created some of the alphabet soup I spoke about earlier, HTTP, HTML, and URL. Again, I won’t go into details but these paved the way for the web we know and love today. The big turning point came, as I mentioned yesterday, with the creation of the first easy to use web browser, Mosiac, created with money funded by the Gore Bill. The important factor here is that Sir Tim didn’t charge anyone for any of this. He released the information freely unto the public where everyone immediately began to contribute and the WWW was truly born. If you had to pay a fee for every transfer of information, above and beyond your carrier fee, there is no way the WWW would have sprung to life so quickly. It’s a hard pill to swallow for a capitalistic libertarian like myself but there is something to be said for the Open Source movement as far as getting tools into the hands of those who can make the best use of them. I’m going to talk more about Open Source later in the week. You can hardly wait, I’d bet! Sir Tim went on to fund the World Wide Web Consortium (W3C) which currently sets the standards for the web and I’ll tak about that later in the week as well. For today, I’ll wrap it up with a tribute to Sir Tim. Without him the internet would not exist today and we all have him to thank. So, if you’ve never heard of him take a moment follow my link to the Wikipedia article or at the very least say, “Thanks, Sir Tim,” when you open your web browser to go about your daily business. All right you geeks and geekesses who follow my blog. Tomorrow I’m going to launch into praise for a fellow named Tim Berners-Lee. 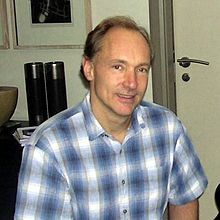 You’ve likely never heard of him but he is largely responsible for the World Wide Web. He continues to be an important figure to this day. The answer is no as I wrote about yesterday. 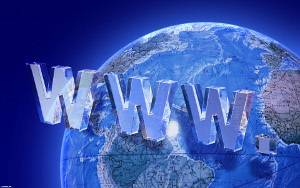 A government agency with the acronym DARPA invented the internet. DARPA is an amazing agency and a model for everyone to examine. However, today I want to talk about why Al Gore said he invented the internet and his role in the thing you are using right now. We have to put on time travel caps to head back … back … back to the 1980’s. 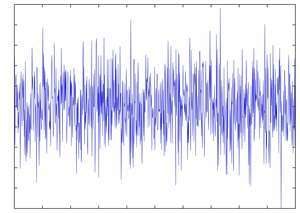 DARPA created the ability of one computer to “talk” to another and that idea was expanded on many fronts after 1975 until computers all over the world were communicating with one another but, much like the real world, everyone was using different languages. People who had different computer systems could only communicate with others who had the same system. This is where Gore comes into the picture. The United States Congress at this time didn’t have many members who understood computers and their potential. One of the few exceptions was Gore who had been championing computers since the 1970’s and was described as an Atari Democrat. That’s my kind of guy! Bring on PONG! 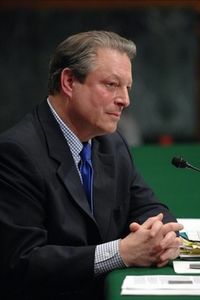 Gore introduced legislation in 1986 called the Supercomputer Network Study Act and after hearing a lecture to congress by Leonard Kleinrock began to work on a piece of legislation that eventually came to be called the Gore Bill although was officially titled High Performance Computing and Communication Act of 1991. This bill led to the creation of the National Information Infrastructure for which Gore coined the phrase Information Superhighway. Upon signing the bill President George H. W. Bush said it would help unlock the secrets of DNA, open up foreign markets to free trade, and a promise of cooperation between government, academia, and industry. Probably much hyperbole there but the fact that the internet has changed the world is indisputable. And the fact that this bill with its various funding arms paved the way for what we see today is also not in question. Funding directly related to this bill helped a fellow named Marc Andreessen create the Mosaic Web browser. The first browser! Andreessen said, If it had been left to private industry, it wouldn’t have happened, at least, not until years later. Two internet pioneers you’ve never heard of, Vint Cerf and Bob Kahn, credit Gore. No one in public life has been more intellectually engaged in helping to create the climate for a thriving Internet than the Vice President. Now, as to what Gore actually said on that fateful day he claimed to invent the internet: I took the initiative in creating the Internet. Not true. He didn’t create the internet nor take an initiative in doing so. I spoke about all that yesterday. However, what he did do was extraordinarily important and the fact that you are reading this today on whatever computer system you have is thanks in at least some small part to Gore. So, love him or hate him, we can’t deny his important influence in bringing together this thing we call the internet. Hats off to Al Gore! Another lesson to learn is that sometimes public speakers don’t convey the idea they mean with the utmost clarity and taking their exact words to task to try to paint them in a negative light is something we see all too often. So, the next time a political pundit or politician attacks a rival for an exact quote, take the time to find out what was actually meant. It’s called critical thinking. Yep, the much-anticipated article about how Al Gore invented the internet! Well, it may come as a surprise to you but he didn’t actually invent the internet. I went over its invention this morning with DARPA where I also got a chance to reference Galt’s Gulch from Atlas Shrugged. It was actually a good article although the title is a bit dull. Go look! I command it. So, if you hate Al Gore or if, by some chance, you love him; don’t miss tomorrow’s blog because there’s something for everyone! I think I’ll spend next week talking about the internet, its origins, the important figures in its development (yes, Al Gore is in there) and what is it evolving into. It’s an interesting story that has changed the world although I’m not certain how much objectivism and critical thinking come into play. I’m sure I’ll manage to make some tie-ins. Tomorrow I’ll talk about an agency called DARPA and how its employees created the first internet, why they did it, and they amazing things that they are working on today. At least the ones we know about! Today I’m going to talk about the psychological phenemonon called Splitting. It seems innocuous enough verbally but it’s a huge problem particularly seen in people’s voting rational. 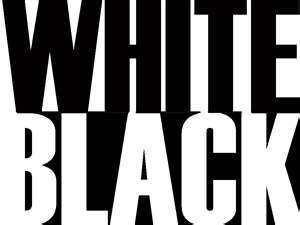 It is defined generally as the splitting of mental concepts (or black and white thinking). This sort of thinking has, in my opinion, caused the country to become driven into two different camps when in actuality most people are nearer the center of political ideology. It is encouraged by the two viable parties, Democrats and Republicans, because it assures that if one doesn’t win the election the other will and this keeps out those who threaten their dominance of power. It is also encouraged by yellow journalists in their endless pursuit of ratings which, naturally, is a product of our viewing habits. I’ll probably talk about how we drive the media and not the other way around in a future blog. Splitting is a dangerous way to think in many ways. It occurs not only in the political spectrum where you are inclined to believe a candidate not because of what they say but because of what party they are affiliated with but also in personal relationships when you attribute a person with particular virtues or vices. A person lies to you once so they are forever a liar or a person tells the truth once and so you believe everything they say. This is a natural phenomenon to some degree but it should be tested constantly. You should try to critically analyze each event in your life so as to properly judge it. Splitting was first described by Pierre Janet and later analyzed by Sigmund Freud and his daughter Anna. However, in the sense that I am using here today we have Melanie Klein to thank. She argues this comes from when we are babies and there are good things and bad things and this mode of thinking haunts us into adult life. Otto Kemberg argues that the ability to overcome splitting is one of the important developmental tasks of children. This ability to view the world in more complex shades is important for our overall development as adults. Generally things are complex and when we view them as simply good and bad we are acting like babies. This is the view that politicians would like us to have. They don’t want us to examine their propositions closely. They sieze upon relatively innocuous statements and turn them into full blown splitting insanity. President Obama says 57 states instead of 57 elections and he must be a moron. Newt Gingrinch mentions moon bases and he must be a lunatic. A political ally of Mitt Romney says Etch-a-Sketch and that means Romney will totally change everything he believes in after the primaries. This sort of thinking leads us to vote for politicians who are uninterested in deep thought and real solutions. Simple splitting is the act of babies. Babies. Grow up and examine situations with an adult, critical mindset and we will get politicians who cater to that mindset. Keep thinking like babies and we’ll keep getting politicians who think the same way. And the country will suffer. 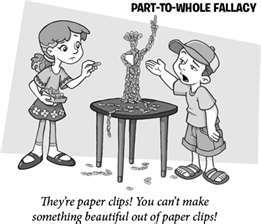 I originally hoped that I wouldn’t have to post critical thinking fail articles frequently but, in all honesty, I find that I have to use restraint lest I pester you even more than normal. But, I couldn’t stop myself when I read about VHEM. Never heard of it? Neither had I. 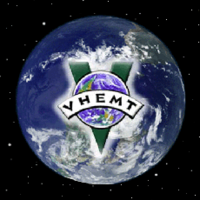 The Voluntary Human Extinction Movement. Yep. You heard right. The basic concept is that in order to prevent human suffering we need to stop giving birth so the human race goes extinct. Hmmm, let me try to come up with the flaw in that attempt at critical thinking. Yes, true, there will be no human suffering if there are no humans. Can’t really argue that one. You’ve got me there. Um, well, if we wanted to eliminate the suffering of say the Southern Long-nosed Armadillo then the solution would be to …? I suppose the ultimate would be to destroy everything so that nothing suffered? The point isn’t to alleviate suffering by destroying everything. The point is to alleviate suffering by achieving great things! Lions alleviate the suffering of hunger by killing wildebeest, wildebeest alleviate the suffering of being eaten by avoiding lions. Let’s kill them all and avoid any suffering? Madness. Even if you’re of the opinion, I’m talking to you Jim, that humans are a net negative on the world you still can’t give up hope and quit. So, VHEM, you win today’s Critical Thinking fail award. Oh heck, just for the fun of it, fill out the poll. While reading the news I recently came across a story about how hugging is now illegal in a New Jersey School. Naturally the original story sensationalized the situation and a better explanation came forth. Still, it got me thinking about why the rule was created and how it reflect the United States’ plunge into fear. Likely a pair of middle school students were behaving in some sexual manner and this rule resulted out of fear. This seems to me to be the root of the issue. The fear of a bad apple causing us to throw out the entire barrel. Not that raging hormonal twelve-year olds is something that should shock us but I’ll talk about this strange puritan-like fantasy we seem to have constructed in our minds when it comes to children another time. This all comes down to fear and whether we let it rule our lives. I’m of the opinion that the U.S. has gone from a daring nation filled with courageous people to a nation cringing in the shadows afraid that something will go wrong. Not to say there aren’t heroes out there who are starting new businesses, taking chances, defending our streets and our nation, but I think on the whole we’ve taken a turn to the craven. Maybe this transition from bold to fearful is at the heart of the descent of all-powerful nations. A nation with more to lose, more security, is one that would tend towards caution whereas the young nation with little to lose acts boldly. Or at least the people of that nation do so. The Daisy advertisement was used by a seasoned fear monger, Lyndon Johnson, against Barry Goldwater. It worked. But, it’s not just politics, we see this is advertising multiple times a day. Much of the religious fervor we see is based on fear. Here we have Jesus Camp and here we have Terrorist indoctrination. Parents are told danger lurks at every corner. We see glaring statistics like 2,000 children kidnapped a day! Horrifying at first glance, hide your children. Except that the vast majority are “kidnapped” by a relative in a domestic dispute and returned within a week. I could go on endlessly how people with agendas use fear to control us but now I want to get to the solution. Fear is real, there are things to fear, and you should modify your behavior to this danger. However, you should analyze the motives of the person trying to scare you and absolutely go out and find if the things they are saying are true. For example, the ads I’ve posted above. 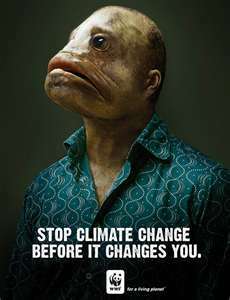 Drunk drivers do kill people, drug addicts do turn to prostitution, climate change … well, it’s not going to turn you into a fish! However, is the solution to never drive again? 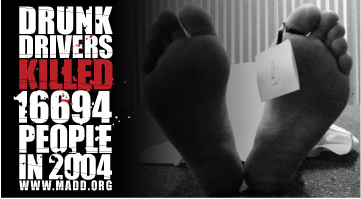 Create a ridiculous, failed, expensive, “War on Drugs”? Reduce your carbon footprint by hiding in your house? How about you pay attention when driving, particularly on weekend evenings? Look into the arguments for legalizing drugs? Switch to efficient lightbulbs and dryers? Don’t let fear rule your life but don’t ignore it. Particularly pay attention to a politician who tells you that the sky will fall if their opponent is elected. The next time you have a political debate and your counterpart tries to frighten you; look them in the eye and say, “I won’t be scared.” Teach your children the same. If your twelve-year-old child is touched inappropriately don’t tell him or her to stop hugging, tell him or her to scream at the person who did it and if it happens again report it. If we continue down this path of fear we will eventually find ourselves as a bunker of a nation peering out over the edge unable to act or live. We cannot trade freedom for safety because the result is neither. They who can give up essential liberty to obtain a little temporary safety, deserve neither liberty nor safety – Benjamin Franklin. The expression goes that one bad apple spoils the barrel. 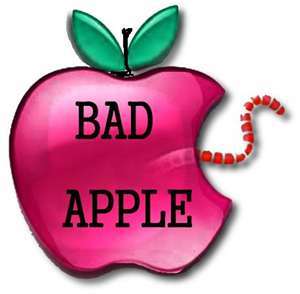 I’m of the opinion that the fear of bad apples is much more dangerous than the bad apple itself. This fear is endangering our life, liberty, and ability to pursue happiness. I’ll talk about how the United States seems to be becoming a nation that lives in fear rather than a nation that conquers its fears. It will likely end up being a multi-part article but I’ll get started tomorrow. It’s hard to believe but the final day of Government Week is here and I can almost hear the sighs of disappointment from all three of you who have followed this exciting topic from the very beginning! Ok, maybe it was only one of you. Thanks, mom! Tomorrow I cover the form of government that does not exist and yet should be the model for everything. Meritocracy. Stay tuned and I’ll explain the concept and why the further we get from this ideal the worse our government becomes. 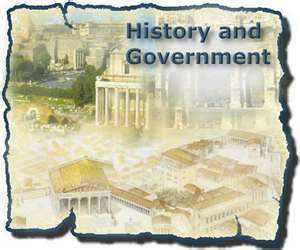 Today’s topic in government week is Theocracy. It is rule by religion or as generally defined: Theocracy is a form of government in which the official policy is to be governed by immediate divine guidance or by officials who are regarded as divinely guided, or simply pursuant to the doctrine of a particular religious sect or religion. The most common place we see this form of government today is in Islamic countries like Iran and Saudi Arabia. It is generally totalitarian in nature in that religion often has little room for those who disagree. This hasn’t historically been true completely as some theocratic states in the past have allowed those of different religions to flourish. More normally other religions are persecuted under this form of government. In the United States Mormon’s founded the State of Deseret but this was disbanded before they became a state. The Founding Fathers explicitly forbid this form of government in the United States. Theocracy is different from a state sponsored religion wherein the government officially endorses one religion or another but has laws separate from it. In a theocracy the state is considered to be run by appointees of god with rules handed down by god. This is probably the most troubling aspect of a theocratic state. If the laws are handed down by god they must be interpreted as infallible. Thus there is no mechanism for correction. One of the concerns of Christians in the western world is the institution of Sharia Law in their countries by burgeoning muslim populations. Interestingly, much like christian law if taken from, say, the Ten Commandments much of this the antithesis of the freedom and individual responsibility that Libertarian’s like myself advance. For example, both have laws about tithing or alms which is giving money to the religious leaders but would come under the concept of illegal taxation from a Libertarian point of view. Both have laws against adultery which again would be opposed by a Libertarian who believes the state should have no say in such matters. Both have laws against homosexuality and once again Libertarians argue the state does not belong in such matters. Both generally forbid people from other religions to hold important offices within the state. Penalties doled out in theocracy tend to be extreme. In most religious states the penalty for adultery is stoning. I could go on here but I think it’s relatively clear to most people that the rule of law is not handed down by god. For my Christian readers I highly suggest a full reading of the ten commandments. I think you will be surprised at the text. Anyone who told you they are basis for law in the U.S. is not being honest. Theocratic rule is a constant danger in that people who live by Faith Based Thinking standards are not constrained by logic, by evidence, by common sense. They know they are right without examination simply because they believe. This absence of critical thinking necessarily leads to an oppressive, freedomless state as we see in countries like Iran and Saudi Arabia. People in such countries yearn for their freedom and in places like Libya, Egypt, and Tunisia we see an Arab Spring wherein the population rises up against oppressive rule. The danger, of course, is that one oppressive regime will be replaced by a theocracy that is equal or worse in their fear of freedom. Thanks for reading and share away! Tomorrow government week continues with a real hot button issue the theocratic state. This is a form of government this is causing great concern both inside and outside the United States. You may not know what it means now but if you stick with me on this exciting series of topics you’ll find out tomorrow!